The death of Alexander Alekhine in 1946 left the chess world without a World Champion for the first time in 60 years. The question of what to do next was resolved with a five-player match-tournament held in The Hague and Moscow in 1948. 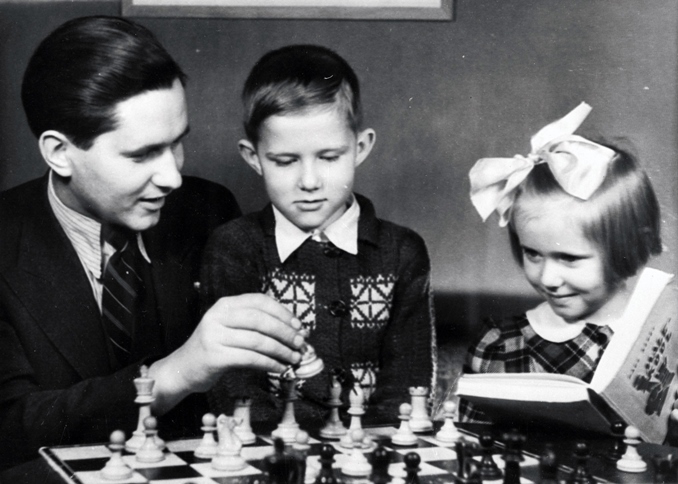 On paimaper it was another chance for Paul Keres to fulfill his dream, but as Joosep Grent explains in his latest installment of the series on the Estonian genius, it wasn’t to be. Four losses in a row to Mikhail Botvinnik meant the “Patriarch” of Soviet chess became the 6th World Champion. Alekhine was the first World Champion to die while still the title holder. FIDE thus faced a unique situation with no clear-cut solution: how to decide the new World Champion? The eventual decision was that a quadruple round-robin tournament would be held with six of the world's best players. 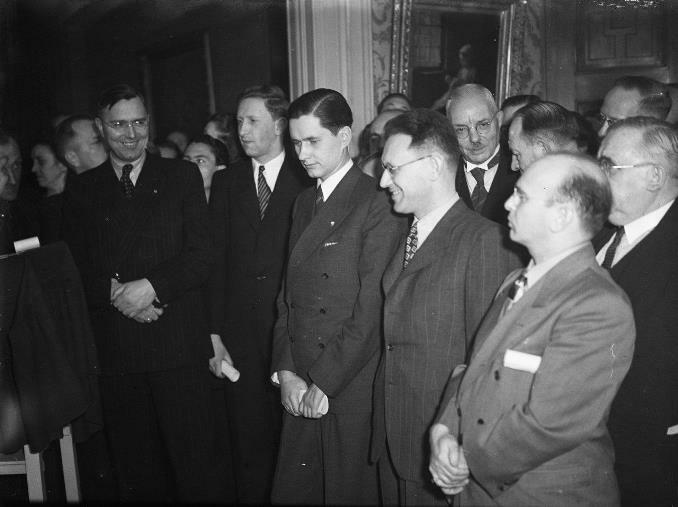 The players chosen for the tournament were Euwe, Botvinnik, Keres, Flohr, Fine and Reshevsky, but Fine decided not to participate and the Soviet Union decided to replace Flohr with Smyslov. Heated negotiations between the Soviets and FIDE regarding the location of the tournament ended in a compromise, with the tournament held as a five-player quintuple round-robin whose first half was played in The Hague, while the second took place in Moscow. 28…Rxe4! only temporarily won a pawn, but when Euwe landed a rook in the heart of White's position with 32…Rd3 he had an overwhelming position. Nothing about the game suggested Keres was holding anything back. On the contrary, it appeared that one of the favourites had started off in the fashion of his earlier successes. The next game saw Keres wipe Smyslov off the board in a mere 27 moves after starting a vicious attack with 19.Ng5! and 20.f4! Botvinnik started with a second round win over Euwe after receiving a bye in the first round, but found himself overshadowed by Keres. We were extremely happy and returned to the hotel with Ragozin. “Important game,” said Ragozin. But of course I knew how important it was! My win over Euwe was dimmed by the success of Keres. The effect of his two wins was so unsettling that even my second was irritated. But on the second day we carefully analysed these games of Keres and then came to a conclusion: “Keres played well, but not better than he usually did. And Botvinnik's assessment was correct. Indeed, despite the dazzling impression these victories created, Keres remained objective and identified many inaccuracies on his part. While the inaccuracies proved insignificant in the context of the first two games – they occurred in winning positions – the following games proved that the significance of inaccuracies is entirely dependent on the context in which they are made in. Reshevsky was able to develop an initiative against Keres out of the opening and mutual time-trouble culminated in Keres resigning after his already bad position was completely wrecked by 39…Bd4?? With 40.Qe8+! and 41.Rb8! Reshevsky set up a deadly battery on Keres' back rank. Reshevsky then found himself in a similar situation against Botvinnik in the next round, again with an advantage, but on this occasion Botvinnik emerged victorious after Reshevsky made four unforced errors, losing two pieces and the game in the process. Finally my game with Keres. He had begun the tournament in superb style with two wins, but I felt that this had no great significance. The wound which I had inflicted on him in Moscow could not fail to tell, I merely had to keep my spirits up. (…) The game was adjourned with me a pawn up. I had to find a forced win. I look for it, but cannot find it. I ask for help from Flohr. Salo does not let me down, and found such a 'quiet' move that it all became clear. After receiving an unusual six days of rest due to this scheduling anomaly, Keres played Botvinnik on the seventh day. Botvinnik noted that when Keres appeared for the game he seemed evidently shaken, nervous and “pale as death”. Botvinnik claimed his prophecy as the reason for Keres’ appearance, but a likelier reason was that Keres had been summoned for a ‘discussion’ by the Soviet officials prior to the game. That concluded the part of the tournament played in The Hague. Botvinnik emerged as the clear leader with 6.5/8 while Keres sat on 50% with 4/8. Botvinnik, a renowned psychological warrior, quickly attributed Keres’ mistakes to his own prophecy about six days of rest and the damage inflicted upon Keres in 1947. A player of his stature and character is prone to seek the reasons for such wins in his own brilliance, while likely dismissing any other scenarios, but it’s highly doubtful that Keres would commit serious errors in his pet opening merely out of fear of Botvinnik. After all, he went on to beat Botvinnik convincingly when there was no external pressure on him anymore, so you really have to seek the reasons for Keres’ miserable score against Botvinnik in this tournament not from Botvinnik or his actions, but factors beyond the board. However, it’s obvious that the contrast between the two players played a major role in engineering such a score. ...the title of World Champion implies its aspirants to have a complex character which has to include a clearly manifest killer instinct. Keres’ contemporary, Botvinnik, fully possessed these characteristics. Botvinnik was a champion of preparation and total psychological warfare. Keres, however, always remained a sportsman and a gentleman in a fight. The contrast between Keres and Botvinnik is one that was not merely seen on the board, but extended well beyond the board as well, and did not escape the attention of those closest to the two rivals. Perhaps Maria Keres is right: the outstanding grandmaster's character was not rigid (or – corrupted!) enough to be not one of the best, but the best of them all. The one and the only. After all, could one ever imagine a Botvinnik who would be late to the first round, sitting to play with a tennis racket still under his arm; or one that attempts to finish a game of bridge in his hotel room, despite his clock ticking; or one that rushes with the analysis of the adjourned position in order to catch up and spend time with visiting compatriots from Tallinn? Because that is exactly what happened to Keres at the famous AVRO tournament, in his game against Alekhine, where he drew an elementary winning position. Sosonko is right on the money here, for it is very difficult indeed to imagine such a Botvinnik. While Heuer believed drawing a won position against Alekhine at the AVRO tournament was merely down to inexperience, it’s clear that Keres’ character was instrumental in the draw. Botvinnik was a methodical, hard-working player for whom the above-mentioned behaviour would be unthinkable. He was most of all upset with people who were full of themselves. He was most upset with discourtesy. He did not really tolerate people who would use any means conceivable to achieve their ends. He always thought that one has to remain a gentleman. 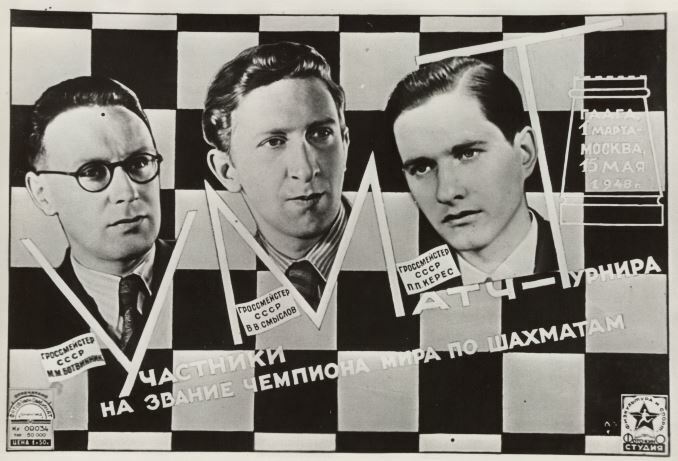 While on the road from Moscow to The Hague, where they played for the World Championship title, Botvinnik ruled out any dealings with his opponents and their seconds. With his second he talked as if with a servant. His communication with his wife was only imperatives and he almost never left his compartment. I believe that one of the most important attributes necessary during tournament play is objectivity and a critical approach both towards your own and your opponent's play. And here most of the players fall short. The usual human weakness of regarding your own moves as superior to those of your opponent always glows through in people's approach to the game. Even if the results don’t support such a view, people still say, okay, I was wrong, but still... I was kind of right. Now, one of the most important attributes that a tournament player must cultivate in his approach to tournament play is to assess every problem he faces critically and objectively. After all, it’s not a matter of who is in the right, but in the fact that every chess player must recognize that if he was not in the right, he must attempt to remedy these shortcomings, which ultimately prevented him from achieving a better result. But if a chess player does not wish to admit that he himself can be responsible for his setbacks, as opposed to hundreds of other distracting side effects, then you cannot hope for the future to bring any improvement. Although this interview was given in his later years, it highlights Keres' character very well and further shows the contrast between the personalities of Botvinnik and Keres. In his encounters with Keres, we also note a definite superiority on the part of Botvinnik, albeit of a different nature than against Smyslov. Whereas the games between Smyslov and Botvinnik that we have commented on above are invariably life-and-death struggles, the games between Botvinnik and Keres are usually rather on the boring side. One gets the impression that Botvinnik wants to keep a tight rein on his dangerous opponent by forcing a type of play on him that does not suit him. Paul was a very fine positional player, but he always aimed at romantic adventures. He was always aiming for attacks and sacrifices, which is why he chose the open game in the opening. He rarely played modern closed openings, which he considered boring. A quick overview of the games between them suggests that Botvinnik took full advantage of this knowledge and indeed aimed to steer all their games into closed positional waters, thus attempting to avoid the strengths of Keres. Who could blame him? We wanted to talk to you about the match-tournament. Don't you think that the American Reshevsky will become World Champion? “Reshevsky might become World Champion”, I said and paused here; all became still. Zhdanov stopped walking about. “But this would indicate that nowadays there are no strong players in the world”. Keres meanwhile played Euwe in the first game in Moscow and won with the black pieces in a mere 25 moves and drew against Smyslov in the next round. Botvinnik started by beating Euwe and Smyslov but then faced his first loss as Reshevsky went on to beat Botvinnik despite being in time trouble. Not Botvinnik's finest hour. Things seemed on the up for the American who was now closer to Botvinnik than before and faced Keres in the next round. A win would have allowed him to come back into contention with Botvinnik, but although Reshevsky achieved an extra pawn in the adjourned position, it didn't look like being enough to win. However, Reshevsky wouldn’t settle for that evaluation, decided to push for a win and allowed Keres to punish that mistaken plan in style, stealing a full point from the American. Keres' 43.g4 doesn't seem to deserve the criticism Euwe gave it, but a series of later inaccuracures led to Keres resigning on move 72 and dropping to third place. He already trailed Botvinnik by 2.5 points and had no realistic prospects of catching him. Misery followed in the next round of games, as after Keres collected a seemingly regular win over the underperforming Euwe he then went on to lose three games in a row to Smyslov, Reshevsky and Botvinnik. When Botvinnik repeated his proposal a few moves later, Keres responded so flagrantly that Botvinnik blushed. Keres had responded to Botvinnik's offer with an obscenity in Russian. Botvinnik blushed. Keres later admitted “Possibly this wasn't too classy on my part.” While he was able to speak Russian, he did not understand everything, and thus sometimes still used vulgarities. I think Keres didn't exactly understand what he was saying. Keres thus finished the tournament on 10.5/20 with the highest number of decisive games (15). His individual score against Botvinnik was particularly distressing (1 win, 4 losses) and has sparked discussion on the subject of whether he was coerced to throw games against Botvinnik, allowing his rival to become World Champion. You can imagine how Reshevsky felt, playing catch-up with Botvinnik but seeing him crush Keres round after round without the latter putting up any sort of active fight. Every game with Keres then became almost a must-win game for Reshevsky. Add to that the fact that Keres managed to beat Botvinnik easily in a game which no longer carried any significance for the overall result and it’s no wonder that, “the Russians have fixed the world of chess” type allegations soon emerged like mushrooms after a rainy day. I plan to address the issue of possible coercion of Keres in a separate chess24 article, since it was too lengthy to be included here. Losses to Botvinnik and the overall result of the championship tournament must have had a profound effect on Keres, for his pre-1948 successes were replaced with a series of disappointing results that commentators and analysts of the time attributed to the search for a new, a more positional style. First it was the USSR Championship of 1948, which took place at the end of the year. Keres started off with five draws and then went on to lose three out of six to become one of the tail-enders. A push in the final rounds boosted him to 9th place out of 19 contestants. The only bright side of the result was his victory against the overall winner Bronstein. Keres then proceeded to write his first tournament book “Maailmameistri-turniir. Haag-Moskva 1948”. He makes little mention of anything that sheds light on his result against Botvinnik, but while the book is light on off-the-board incident, that’s amply compensated for by the sheer volume of analysis. In the USSR Championship of 1949 the pre-war Keres seemed to have found his way back to the board, as he sprinted to 7/10, despite losing a game to Bronstein in the process. But what followed were a number of losses that cost him the tournament. In the 11th round Keres lost to Furman before beating Sokolsky, then lost again to Taimanov in the 14th round but bounced back with a win over Ragozin before losing yet again to Ljublinsky. He then drew his three remaining games. Despite his overall 8th place in the tournament, what is of significance in the tournament was Keres' response to losses. Throughout the event he was able to bounce back from a loss with a win in the next round. Only after losing the game to Ljublinski, and thus losing any hope of a higher-place finish, did he go on to draw the remaining games. 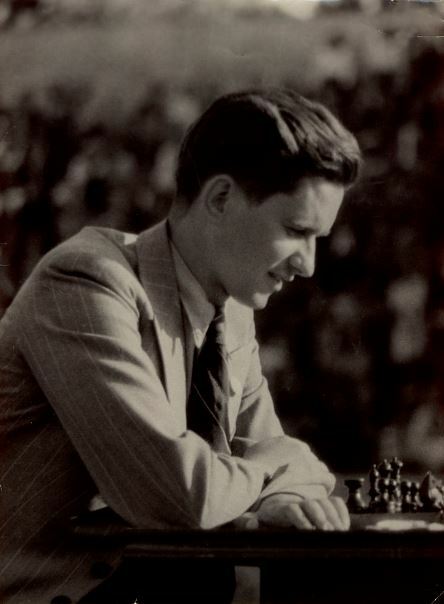 Bronstein won the tournament, though this time he shared first place with Smyslov. My next big tournament was the Candidates Tournament. I had again prepared well and I felt that I was in good form. The tournament began favourably for me. Intense competition continued in the second round of games... But then I had to accept a loss from Kotov in an extremely complicated game, and after having missed my winning chances in a sacrificial game against Flohr, it became clear that catching Boleslavsky was no longer possible. Due to that, I played the rest of my games joylessly and after losing my penultimate round game to Bronstein, finished fourth. However, in this tournament I already played a little better than in previous tournaments of this period, and could thus hope to regain my previous good form. They say: style is your personality. We’ve repeatedly already spoken of his objectivity and correctness. It’s understandable, therefore, that as a mature player he’ll increasingly seek accuracy at the board. When a game becomes calm, he won’t seek to blow the game up but will instead look for “the best moves” - and there’s no sign of “artificially engineered rationality” here. However, when the position called for it, he wasn’t afraid of unleashing his “colourful style”. The commentators were likely side-tracked by their attempt to explain the failures of Keres as scientifically and convincingly as possible. It’s likely that such an approach failed to take into account the simple fact that in the games of this period the percentage of mistakes was considerably higher than ever before, and in fact than it would ever be again. It’s impossible to pinpoint the germ from which these mistakes grew with absolute certainty, but we can assume that he was infected by the World Championship tournament. Enduring such a ruthless blow takes time, and no doubt it left him scarred for life. 15...Bxf4! and the position that arises some moves later is full of excitement. Grynfeld capitulated on move 29. Curiously, this tournament provided one of perhaps the shortest decisive games ever played at this level, as Keres needed just 6 moves to mate the oblivious IM Edward Arlamowski. After that game Keres had a day off, which he spent playing tennis under the intense sun, and as a result came to play the next game horribly sunburnt. He lost to local hero Andrzej Pytlakowski. Despite that, Keres triumphed with an overall 14.5/19, ahead of Szabo, Barcza, Taimanov and Geller, among others. I traveled to the Championship with increased confidence. However, the start of the tournament gave me no hope for anything good. After three hesitant draws, I was able to beat Geller... After that I played a weakly against Alatortsev and lost, then saved a losing position against Suetin and achieved the same result with an extra pawn against Tolush. The situation did not look good, but after these games my play was suddenly off the leash. Something similar to what had happened in the middle of the Semmering tournament began to unfold: every plan I made came to materialize the way I intended. It’s hard to explain, even to myself, the reasons for the appearance of such ups and downs in my play – these occurred quite often, and even at the strongest of tournaments. Keres took the lead midway through the tournament and despite sharing it on some occasions his last round victory over Averbakh gave him the overall score of 11.5/18 and with it the Soviet Championship title for the second time in his career. 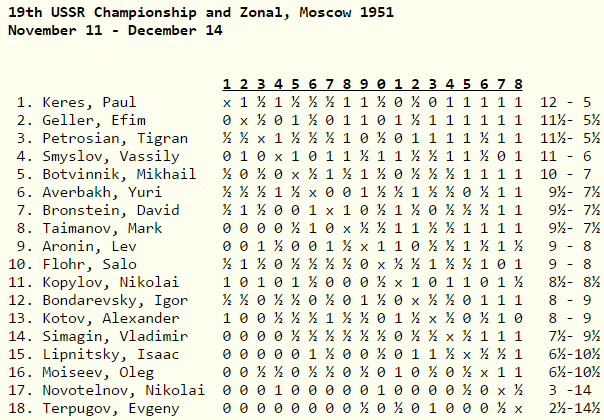 The result was slightly undercut by the fact that both Bronstein and Botvinnik were absent, but they featured in the line-up of the next XIX Soviet Championship, alongside Smyslov, Keres, Geller, Taimanov, Petrosian, Averbakh, Flohr, Bondarevsky and others, making it the strongest Soviet Championship to date. Keres started with a convincing win against Terpugov, offering the latter a queen sacrifice in the process, but then lost his second round game to Kopilov. In rounds three and four, he claimed two victories, against Geller and Aronin, and then drew with Bondarevsky. A loss to Kotov, a draw with Averbakh and a win over Moiseev meant that Keres trailed the leaders Botvinnik, Geller and Smyslov by half a point, as Botvinnik's loss to Smyslov allowed the latter to catch him in the lead. After drawing a game with Flohr, Keres then faced his nemesis, Botvinnik. The latter took his usual line of play against Keres and closed the position, with the players agreeing to a draw on move 58. Keres progressed with wins against Lipnitsky, Novotelnov and drew against Bronstein and Petrosian to catch up with the leaders Geller, Botvinnik and Smyslov. Petrosian is winning! “A 22-year old will become the new Soviet Champion!” echoed over the playing hall. Despite being in a wretched position, Keres does not lose his usual calmness. Using the inaccuracies of his opponent, he saves an endgame a pawn down. Psychologically speaking, this was his greatest victory of the tournament. As Geller loses to Bronstein in the same round, Keres emerges as the sole leader with just one game to go. Despite needing only a draw, Keres doesn't play for a draw: Taimanov finds himself under attack and is forced to capitulate on move 38. Keres thus defends his Soviet Championship title and wins the tournament for a third time. Keres then followed his two Soviet Championship triumphs with tournament victory in Budapest, winning the event in the last round by defeating Gedeon Barcza, leaving Botvinnik, Geller, Smyslov and Petrosian in his wake. Those results propelled him to first board of the Soviet Olympiad team, pushing the World Champion Botvinnik to board two! Botvinnik found this decision preposterous and refused to participate, once more just going to show the strength of the Soviet chess machine. What other team could afford the luxury of pushing a reigning World Champion onto board two due to having stronger options available! Despite Keres playing modestly and scoring 6.5/12 it was the fact that the Soviets could afford immense strength on the lower boards that enabled them to win the 1952 Olympiad, and for that matter every consequent Olympiad for the next 22 years. Keres had achieved formidable momentum and despite the slight hiccup of his first board performance at the Olympiad, he continued striving for his long held dream of playing for the World Championship title. 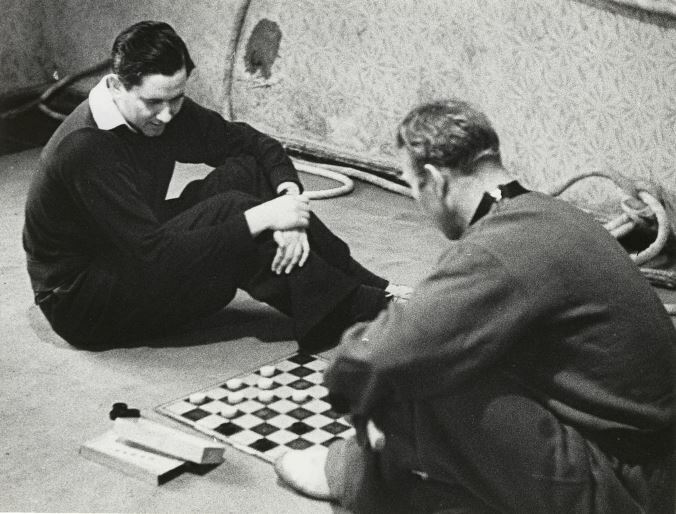 With the Zürich Candidates Tournament of 1953 looming on the horizon, the dream was still alive. But mind you, in 1953 he had already reached the age of 37, meaning that time was not really on his side anymore. Joosep is an Estonian chess enthusiast who learned chess at the age of five and began attending the Paul Keres Chess Club two years later. 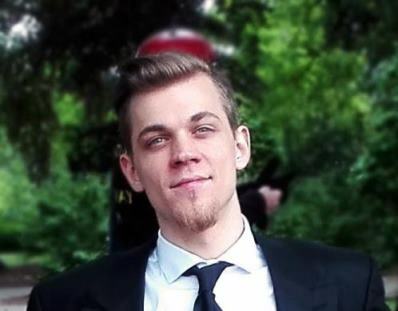 He recently graduated with a degree in History from Charles University in Prague, with his BA thesis set to be published by the university press.